According to the World Health Organization (WHO) statistics, in 2016, a total of about 36 million people suffering from human immunodeficiency disease in the world. Faced such a dilemma, in the efforts of scientists’ study, it seems have a breakthrough. A study on human immunodeficiency virus (HIV) antibody was published in the September 20, 2017 of the journal Science, which is an important milestone in HIV research. Researchers create am antibody with high activity and a wide range applicability based on the genetic engineering technology. It can effectively fight against type I HIV. 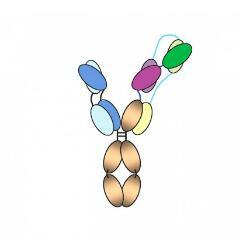 In general, natural antibodies recognize a single target on a foreign protein; in this study, the antibody is designed to identify three different site on the same molecule. The “trispecific” nature of this antibody is very effective in inhibiting the growth and infection of HIV, for HIV was more resistant to antibody action. There were an article on “Development of a Trispecific Antibody Designed to Simultaneously and Efficiently Target Three Different Antigens on Tumor Cells” published in 2015 before. The author designed an antibody which could simultaneous target EphA2, EphA4, and EphB4, and supposed to be an effective approach to cancer therapy. Fig1. 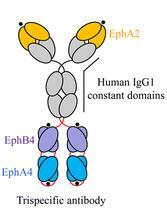 (A) Trispecific antibody for Eph. (B) Trispecific antibody for HIV. The blue, purple and green segments each bind to a different site on the virus. Gary Nabel, chief scientist and senior vice president of Sanofi Pharmaceuticals and also the first co-author of the paper, said: “This ‘trispecific’ antibody differs from the general natural antibody. The antibody combines with multiple targets in the single product, and this feature can improve the prevention and treatment of HIV, and also is a foundation for potential treatment of cancer, infectious diseases and immune diseases. There is a key challenge in using broadly of neutralizing HIV antibodies to address acquired immunodeficiency syndrome. It is necessary to overcome the genetic diversity of epidemic viruses around the world. This “trispecific” antibody has a broader coverage than the previously studied antibody. More than 200 different HIV-1 strains, about 99% can be neutralized by this antibody. The “trispecific” antibody recognizes CD4 binding site, the membrane proximal external region (MPER), and the V1V2 glycan site of HIV, protects monkeys from infection with ape and human immunosuppressive viruses (a partly combination of HIV and SIV genome for study purpose: SHIV). This is an important finding, especially SHIV has shown resistance to single-target antibodies. “Trispecific” antibody is research and development in the use of Sanofi Pharmacy patented technology. The researchers identified and tested a large number of different bispecific and trispecific antibodies. The pharmaceutical industry is currently producing a large number of “trispecific” antibodies in order to carry out the first phase of clinical trials under the National Institutes of Allergy and Infectious Diseases Research Center (NIAID), part of the National Institutes of Health (NIH), in 2018. “Trispecific” antibodies are currently in the stage of clinical trial and its safety and efficacy have not yet been fully evaluated by any regulatory authority.